SymQuest is pleased to announce that our company has attained the honor of ranking 28th in the 2014 MSPmentor 501: North America 200 Edition, an independent review of IT managed services providers in North America, and generally regarded as the definitive guide in our industry. Information technology and cyber-security have been hot-button issues in the news over the past couple of weeks as Windows closed down support of its much-beloved XP operating system and as the Heartbleed bug arrested our attention and ate up hours of our time as we all changed our passwords. We’re proud that we were able to help our customers weather these and other storms. 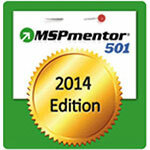 While this recognition from the 2014 edition of MSPmentor 501 is a testimony to the service SymQuest engineers and project managers deliver to our clients across New England, SymQuest remains committed to bringing IT and managed services out of the computer room and into the boardroom. Our model is built around positioning IT as a strategic asset to help our clients outpace their competition. As evidenced by recent developments, businesses need the ability to securely manage their data, but face tighter resource and budget constraints than ever. By shifting the responsibilities associated with IT to a reliable managed service provider, companies are realizing the value of a Virtual Chief Information Officer.